The last time I was in South Africa I had lunch in Mandela Square in Sandton City, a commercial and entertainment hub in the heart of Johannesburg. 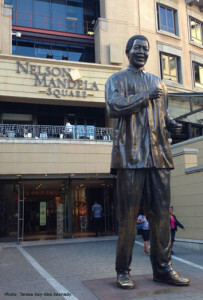 A jovial bronzed statute of Nelson Mandela towers almost twenty feet above the sidewalk cafés and exclusive boutiques. People of different nationalities co-mingle as they dine and shop under foot. Adjacent to the luxurious Michelangelo Hotel, the statute and Square represent a South Africa that Nelson Mandela helped create–where all are considered equal under the constitution and the country itself can participate freely in the global economy. As an African-American born in Ghana, I’ve spent a lot of time on the continent. Like Mandela, my dad was an amateur boxer turned activist (and then professor). Experts in cross-cultural communications, both of my parents worked for five decades on five continents–from Africa to Australia–introducing new concepts of people with the intent of bringing about unity and training new generations of leaders. Since the late 1950s, all of my aunts and uncles on my father’s side of the family worked and lived in Africa. My trip this time was to the Royal Bafokeng Nation near Rustenburg. I was there with fellow Young Global Leaders as part of a program sponsored by World Economic Forum and the Aliko Dangote Fellowship. One of the highlights was visiting the Lebone II College. Even though the Nation is unique in that it owns its land and has direct community participation in major mining ventures, I can’t imagine that its flagship school would have been so diverse and advanced without the broader societal changes that came as a result of Nelson Mandela. Although the initial gains under Mandela have now been replaced with growing unemployment and wide income disparities between the Blacks and Whites, South Africa has certainly progressed from the vicious oppression of apartheid. In the 1990s, my mom joined me on a trip with fellow Harvard Business School alumnae in Cape Town for a private conference and briefing from high-ranking South African officials. 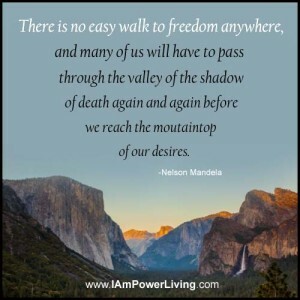 Mandela had recently become President and a new energy was in the air. The country was actively courting foreign investors, and there was hope and a promise of peace. We visited Robben Island where Mandela had been imprisoned for 18 of his 27 years behind bars. Seeing the small concrete cell brought us face-to-face with the stark reality of his life in captivity and the profound nature of his reconciliatory approach after his release. The power of his conviction to bring about a harmonious transition is at the heart of his greatness. Mandela became our conscience. He transcended race and class. His thought was on the collective, not his individual pain. He was an authentic leader who never claimed to be perfect. His is a story of transformation, from militant freedom fighter to peacemaker. As South Africa’s favorite son and their First Black President, he had humility that most leaders lack and was the very definition of dignity. His attitude of forgiveness – even inviting his jailers to his inauguration – was remarkable. He was on a mission – an ardent pursuit of racial justice and later health equality with his fight against HIV/AIDS. Wearing the White Afrikaners green and gold rugby jersey and Springboks emblem during the 1995 Rugby World Cup final, he also knew how to use sports as a means for bringing people together. When I heard the news of his passing I called my uncle, Dr. Joseph C. Kennedy. The elder statesman of my family, he had been the former Washington Peace Corps director for both Africa and Southeast Asia under the leadership of President John F. Kennedy and Sargent Shriver. In 1970, he co-founded Africare, served as the organization’s Senior Vice President and Director of International Development, and continues to be a lifetime Board member. Nelson Mandela was the Honorary Chair of the Africare Board and Uncle Joe spent time with him. “No one is born hating another person because of the color of his skin, or his background, or his religion. People must learn to hate, and if they can learn to hate, they can be taught to love, for love comes more naturally to the human heart than its opposite.” View quote card. It is now our task as global citizens to continue to work toward a “society which all persons live together in harmony and with equal opportunities,” as Mandela said. It’s up to all of us to hold each other to a higher moral standard. We each can fight the good fight – armed with love, compassion and the desire to do what is right. To his family and wife Graça Machel, whom I’ve had the honor of meeting, we send our prayers. To Nelson Mandela, we say thank you for showing us how to love. Rest in Peace Tata Madiba. Read “10 Qualities of Greatness Inspired by Nelson Mandela.” Go to the Power Living Nelson Mandela Quote Card Gallery and/or learn more about the YGL trip to the Royal Bafokeng Nation. Article was originally published in The Huffington Post. Teresa Kay-Aba Kennedy is a Harvard Business School-trained strategist, digital consultant and World Economic Forum Young Global Leader. She helps companies operate more efficiently and individuals live more effectively through her company Power Living Enterprises. A seasoned yoga/mindfulness teacher and executive/life coach, she is also an internationally-recognized voice in Personal Empowerment, Leadership and Health & Sustainability. In addition, she is the co-author (with her mom, Columbia University-trained journalist Janie Sykes-Kennedy) of Dancing Light: The Spiritual Side of Being Through the Eyes of a Modern Yoga Master–an inspirational memoir on 99-year-old yoga master Tao Porchon-Lynch, as well as Shining Bright: Quotes and Images to Inspire Optimism, Gratitude & Belief In Your Limitless Potential.